The National Armed Forces FreedomRide was started last year by a lady named Gypsy aka Cathy Hopper. Every state has their own ride, but are part of the National Event celebrating Armed Forces Day. I am the Utah Chairman, so it is my Honor to organize the ride for Utah. My brother-in-law and three friends rode down from Idaho the Friday before the ride to join us on the FreedomRide. My garage has never looked so good! My family had a pre-ride party Friday night at Liquid Joes to watch Gam e'on play. My son Fenton is in the band, and we all had a good time being groupies for a night. Some groupies had a better time than others, I'll just say that what happens at Liquid Joes STAYS at Liquid Joes! The Utah FreedomRide started with registration at the Fort Douglas Museum, the museum was arranged for by the American Legion Riders. 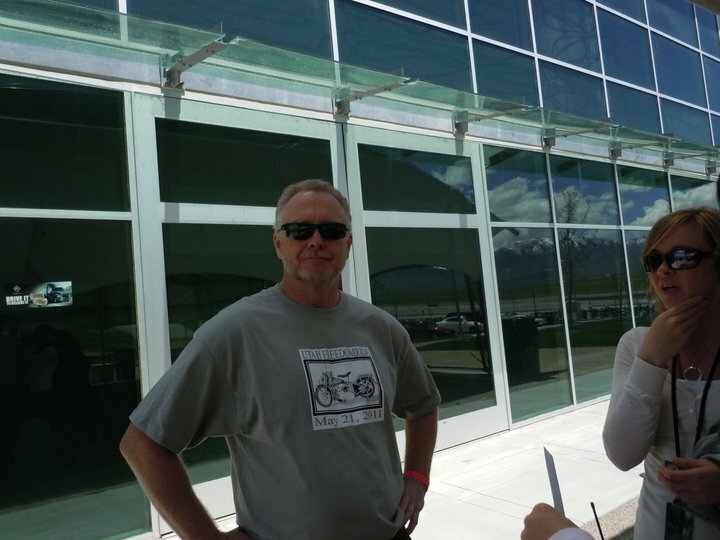 We then rode from Fort Douglas to three military monuments across the valley, and then to Miller Motorsports Park where we took a lap on the race track, followed by lunch while listening to a great oldies band. A car on display. I didn't verify this, but I believe the man in the back did this car as a tribute to his son. A good variety of bikes showed up; much more interesting than a bike specific event. Leaving Fort Douglas. A Spyder is in our midst! We had a flyover...of sorts. The Pentagon has a moratorium on flyovers so we had to take what we could get. Good thing the Tooele airport is nearby. Lining up to take a lap on the Miller Motorsports Park track. Filing out to the track behind the pace car. I'm in good company, an Aprila, Victory, and a BMW K 1200 are in front of me. Painted Desert, an AWESOME band put on a great show donating their time and talent for a super cause. All proceeds will be donated to the Homeless Veterans Fellowship. Thank you to everyone who came out and helped it be a great day! Will & Debbie - How did we ever survive without you? Tiffany - In charge of registration and had multiple family emergencies Friday night but still took care of her part. THANKS TIFFANY!!!!! Jacob - Worlds best Wingman! Fenton - Much needed and always there Tech Support. Kaybi - Has ever been and always will be my Favorite Daughter! Camille - Who jumped in at the last moment and helped a ton! Beverly - My most ardent supporter.